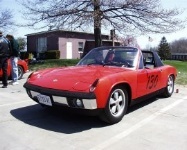 The 914 is actually a conversion made from a totaled factory six. It has all of the factory goodies except for the VIN and newly installed Rich Johnson motor mount. My original thought was to just drive the car. Then I thought about making it into a track car. Now, I'm back to thinking a driver would be nice. Oh man, I change my mind more often than the stereotypical woman! Well, first things first; the car needs to be restored. While it's structurally solid, it has it's fair share of body rot. For the time being, I'm just "covering" the rot with the POR15 system. When I get the time and cash, I'll have someone who knows far more than I replace the bad stuff. 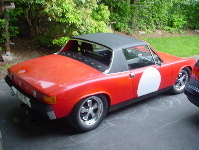 I'll probably do the "Kustom" paint myself in a '70s hippie theme. November 2006: There will be some changes sometime in the future. As I "repair" the fenders, I will leave each in red primer and just add some pinstriping for the RatRod look. At this point. 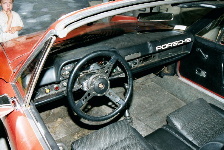 I have no available funds to throw at the Porsche. The insurance has been dropped as has the registration. The car is asleep in the garage since spring 2006. 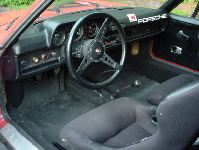 I'm in the process of selling the race seats and will reinstall the stock interior. I guess I'm really a Sunday driver more than a track junkie after-all. 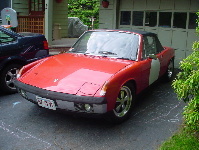 September 2007: The car still sleeps in the same spot but I did take out the broken pedal assembly and sent it off to Bruce Stone to a rebuild. I sold off my race seats and will reinstall the factory stuff again. Maybe I'll be able to recover them first and maybe I won't. Once I can drive the car under it own power, I'll buy a good quantity of primer and spray the whole car. Then I'll do some airbrushing and pinstriping. Hopefully this will happen this fall.